I apologize for Test It Tuesday being out of commission for a few weeks. But it’s back – with lobster in the form of bisque! Lobsters are in the crustacean family. Lobster bisque is of French origin. I could tell you a lot more about all of this (thanks to Wikipedia), but I’ll spare you. I will say that the thought of throwing a live lobster into a pot of boiling water is pretty horrifying (and apparently, in one part of Italy, that’s illegal). No, I am not a vegetarian. But yes, I prefer that someone else kill my food. Another thing I can tell you is that lobster meat is very expensive and not the easiest or most common item to find. When my husband went to our local grocery store, they did not have it. The original blogger said that she found a bag of frozen lobster meat from Trader Joe’s, so we went there next. They were out, expecting their next shipment later that evening. The problem was, TJ’s is about 20 minutes from my apartment (therefore out of the way), and I was hoping to make it that night. So we went to another nearby grocery store, where I found a frozen tub of Maine lobster, 7 ounces, for THIRTEEN DOLLARS. I have no idea what the price is at TJ’s (but if someone else knows, please let me know!). This bisque is quite extravagant – in price, in taste, in richness, in decadence, in everything. It is like a restaurant meal. 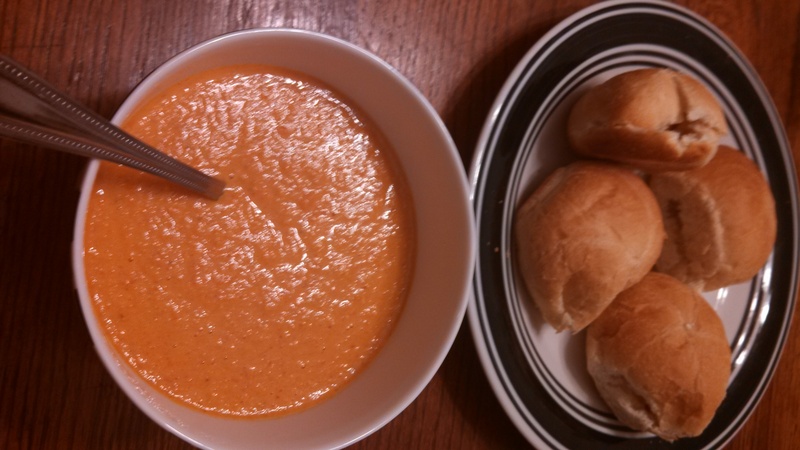 One of my friends told me that his sister makes lobster bisque every Christmas, but she does it legit from scratch – she boils the lobster, makes lobster stock, and so forth. Apparently her method takes 2 days and comes to about $20/bowl. Thankfully, my recipe was not *that* intense. 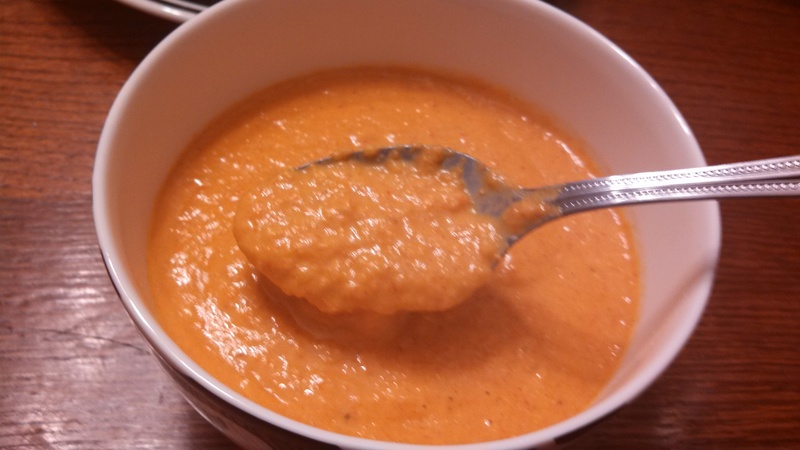 I’ve never ordered lobster bisque myself in a restaurant, but my husband has, and he loves it, which is part of the reason I decided to make it. It was much better than I expected it to be, to be honest. I will say that handling lobster meat was a bit unnerving, but once I got past that, it was all good. It was also relatively simple – the original blogger cautioned to stir often in order to not allow it to stick/burn to the bottom, but I didn’t have that issue at all (thanks to my nonstick stock pot, perhaps?). I used dried thyme instead of fresh thyme, but I did use the bay leaf. I’m not sure if I’d include it next time, only because it’s expensive, and you can’t buy just one, and I’m not sure how much it really added to the flavour. In addition, we used the seafood stock “flavour boost,” instead of actual seafood broth (we couldn’t find it), so I mixed those packets with water, which worked really well. The spices in it also really contributed to the flavour, which my husband loved too. The original blogger also used 12+ ounces of lobster meat, however I only used 7 (because there was no way I was going to pay $26 for two packages of lobster meat). It probably would have had an even stronger lobster-flavour if I had used to full amount. Something to note, though, is that next time, I would make sure to ONLY make enough for how much we’ll eat in one sitting. I had some leftover bisque the next day, and there was just something very weird about eating re-heated pureed lobster meat. But maybe that’s just me. -In a large stockpot, melt the butter over medium-high heat. Add the onions, carrots, celery, garlic and tomato paste, and saute for 5 minutes or until the onions are cooked and translucent. Sprinkle the mixture with flour, and stir to be sure that it evenly coats the veggies. Saute for about 1 minute. 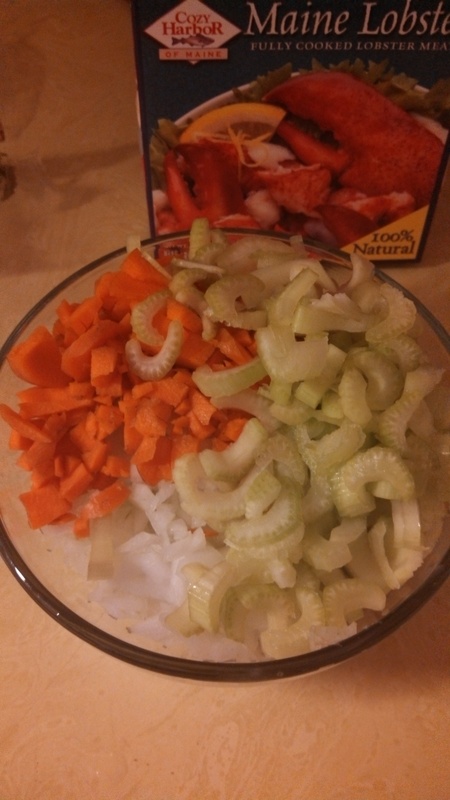 -Add the seafood stock, white wine, cognac, lobster meat, paprika, bay leaf, thyme and cayenne, and stir to combine. Cook for 30 minutes over medium-low heat, stirring occasionally to prevent the bottom from burning. -Remove the bay leaf and sprig of thyme. Stir in heavy cream, and season if needed with extra salt and pepper. -Then puree the soup using an immersion blender. Or you can transfer the soup in small batches into a traditional blender and blending until smooth (I used the traditional blender method, and it worked great).